UT Southwestern Medical Center researchers have designed and built a microscope capable of creating high-resolution, 3-D images of living cancer cells in realistic, controllable microenvironments. 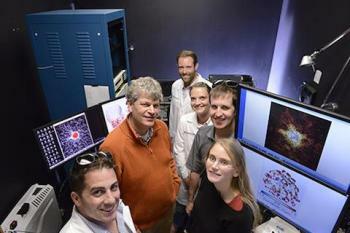 Members of the research team from UT Southwestern’s Lyda Hill Department of Bioinformatics who helped build and test a microscope capable of creating 3-D images of living cancer cells included (l-r) Drs. Kevin Dean, Gaudenz Danuser, Erik Welf, Claudia Schäfer, Reto Fiolka, and Meghan Driscoll. "There is no microscope that allows us to look at living cells with this resolution and precision in a controlled microenvironment. We can now create 3-D images of cancer cells and record how they interact with their microenvironment via signaling," said Dr. Gaudenz Danuser, Chair of the Lyda Hill Department of Bioinformatics at UT Southwestern and corresponding author of a study detailing the project published this week in Developmental Cell. This approach enables researchers to study cells in controlled microenvironments at a level of detail that should accelerate the pace of discovery in many fields of biology, Dr. Danuser explained. "It's a two-photon, light-sheet microscope that allows 3-D time-lapse imaging of cells deep within physiologically realistic microenvironments," said Dr. Reto Fiolka, an Instructor of Cell Biology at UT Southwestern and fellow corresponding author of the study. Using the new microscope and software, the researchers created 3-D images of the detailed shapes that skin and lung cancer cells develop as they move through tissue. They also created images and movies of the dynamic activation of a key signaling molecule (PI3-kinase) that is involved in many cellular processes. The new microscope was designed to solve a long-standing problem in biology: the need to artificially constrain cells -- usually by flattening them onto glass plates in two dimensions -- in order to image them clearly. The trade-off between image clarity and environmental realism has existed for centuries, the researchers explained. "It's long been known that the microenvironment profoundly influences how genes are expressed and cells behave, but no mass-produced microscope allows observation of cells under realistic conditions," Dr. Fiolka said. "The practical utility of medical research depends on how accurately laboratory experiments can recreate biologically realistic environments." Images viewed with traditional microscopes are sharp in the horizontal plane, but more blurred in a cross section along the third dimension, he added. With this two-photon, light-sheet microscope, researchers can look in any direction and see a crisp image. The researchers call their new approach "microenvironmentally conscious imaging." "This approach will create opportunities for researchers to make observations at the subcellular level without compromising microenvironmental control, which should open a window for addressing fundamental questions in cell biology," said Dr. Danuser, who holds the Patrick E. Haggerty Distinguished Chair in Basic Biomedical Science. The researchers designed the new microscope so that scientists could carefully control the microenvironment and change that environment to study how cells interact with tissue. It is realistic, but shouldn't be called natural. The only truly natural environment is the one within the body, where there are too many variables for well-controlled experiments, Dr. Danuser explained. The images created by this new approach diverged from previous two-dimensional glass-plated images. For instance, skin cancer cells show thin, elongated protrusions when viewed on glass plates. In 3-D microenvironments, those cells instead show rounded protrusions called blebs, but it is too soon to say if those blebs are involved in cancer cell movement, spread, drug resistance, or something else entirely.